Erythropoiesis-stimulating agents (ESAs) can correct anemia in chronic kidney disease (CKD) but are associated with increased risks of cardiovascular events. 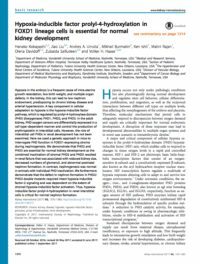 Vadadustat, an inhibitor of hypoxia-inducible factor prolyl-4-hydroxylase domain (HIF-PHD) dioxygenases, is an oral investigational agent in development for the treatment of anemia in patients with CKD. In a 16-week, open-label, multicenter, Phase 2 trial, Haase and colleagues evaluated vadadustat in 94 patients receiving maintenance hemodialysis previously maintained on ESA therapy. Patients were converted to vadadustat and assigned to a prospective dose cohort: 300 mg daily, 450 mg daily, or 450 mg thrice weekly. The primary endpoints were the mean hemoglobin change from baseline to mid-trial and from baseline to end-of-trial. No significant changes in hemoglobin concentrations were observed for the two time points in any of the three treatment groups. Hemoglobin concentrations remained stable after conversion from ESA therapy for the duration of the trial, with a single excursion >13 g/dL. Plasma concentrations of vadadustat or its metabolites were not affected by hemodialysis. Post-hoc analyses found no association between the final vadadustat dose and achieved hemoglobin, baseline hepcidin, C-reactive protein, or previous ESA dose. The overall incidence of adverse events (AEs) was comparable across treatment groups. No deaths occurred during the study. No serious AEs were attributed to vadadustat. 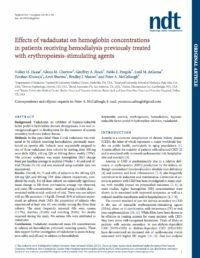 In summary this new study concluded that Vadadustat maintained hemoglobin concentrations in patients on hemodialysis previously receiving ESA therapy.